Despite all these positives, many people have never heard of squash. Or maybe they have heard of it but don’t know how squash compares with other sports. So, what’s it all about? Squash is a fast-paced racquet game usually played by two people on an indoor court. The most common form of the game is softball squash, but people just call it “squash”. The sport of squash encourages lots of running. You’re chasing the ball all around the court. Squash might not look too difficult when you’re watching from the gallery, but trust me, after moving forwards and backwards and side-to-side for just 30 minutes — all while swinging a racquet — you will probably be exhausted. You’ll need a few pieces of equipment to play: a squash ball, and a racket for each player. It’s best to get some non-marking court shoes and protective eyewear too. Each point starts off with a serve, and then the players alternate shots until someone wins the point, either by hitting a winner or forcing the other person to make an error. A squash game is played to 11 points. 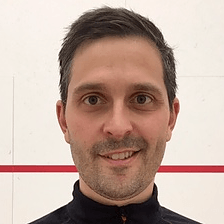 Read my Squash Rules and Scoring Summary for more information. Also check out my Basic Strategy Guide for tips on how to play squash. The history of squash is pretty fascinating. It was first played in the mid-1800s by English schoolboys at the Harrow School, outside London. Gradually, the game caught on in popularity, and squash courts started sprouting around the world. Today there are several variations of squash, such as squash doubles, which is played by teams of two on a larger court, and hardball squash, which was played widely in the US until the 1990s. There are also my kids’ squash rules, which involve rolling lots of balls around on the floor and chasing after them in all directions. Squash is not a “big-money” sport like so many others, in part because it’s been difficult to televise, though that is changing rapidly. 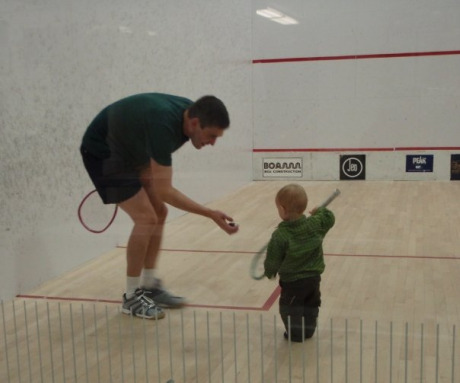 For now, squash has grown as a sport simply because it’s fun to play and great exercise! Give it a try, and please let your friends know about this hidden gem of a game.